Welcome! 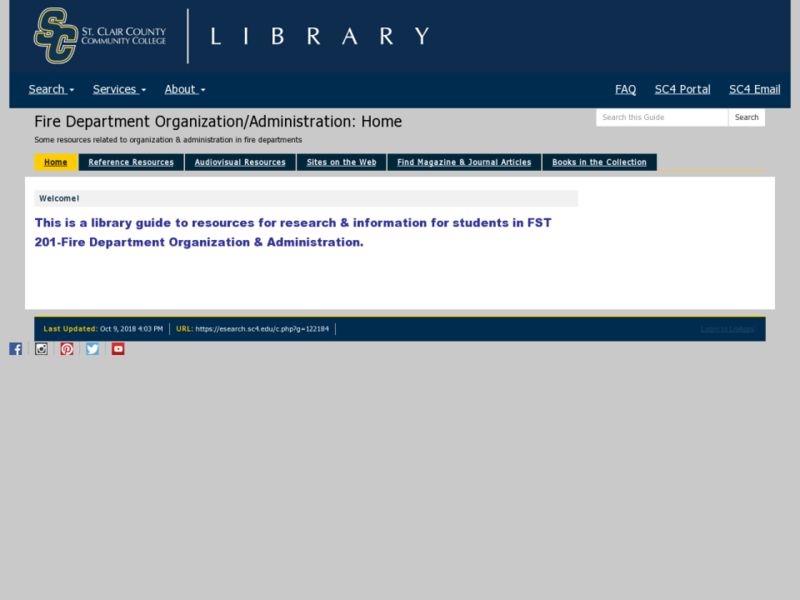 This library research guide provides an introduction to library resources related to the Fire Science program and courses. "the study of all aspects of fire, from fire behavior to fire investigation." Text: "Fire Science." Merriam-Webster.com. Merriam-Webster, n.d. Web. 22 Sept. 2016. Students in fire investigation are the audience for this text, which covers various types of fires: structure, wildland, automobile, fabric, and chemical. Topics are presented in logical order from simple chemistry and physics to scene analysis and complex case analysis. Firefighter Preplan is the ultimate guidebook for thriving as a firefighter. In this book, you will discover the secrets of great firefighters that have never been shared in a book before. You will be given the strategies and tactics of great and respected firefighters and a plan for how you can become one too. A full-text resource that offers scholarly content most relevant to vocational programs.